When you're at your gig, you'll definitely be glad you have the Hughes and Kettner Redbox 5 direct box and speaker emulator. First off, it's a great-sounding DI. And second, it eliminates the need for a microphone on your combo amp or speaker cab. Just connect it between your amp and cab, and send the XLR speaker-emulated output right to the mixer. The Redbox 5 gives you deep control over the sound of the emulated speaker, and it sounds awesome. 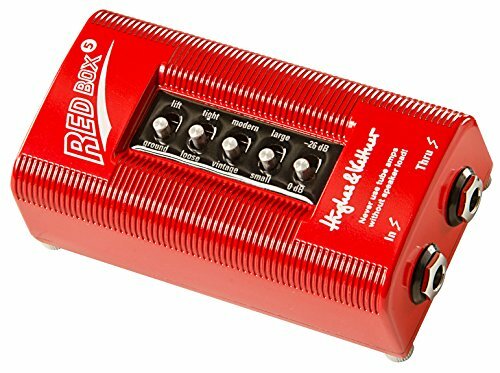 Take the microphone and the room out of the equation and get fantastic guitar tone with the Hughes and Kettner Redbox 5. View More In Signal Processors. If you have any questions about this product by Hughes & Kettner, contact us by completing and submitting the form below. If you are looking for a specif part number, please include it with your message.